by Gov. Rick Perry (R-TX) & Gov. Mark Sanford (R-SC), Opinion Journal, The Wall Street Journal: As governors and citizens, we've grown increasingly concerned over the past weeks as Washington has thrown bailout after bailout at the national economy with little to show for it. In the process, the federal government is not only burying future generations under mountains of debt. It is also taking our country in a very dangerous direction -- toward a "bailout mentality" where we look to government rather than ourselves for solutions. We're asking other governors from both sides of the political aisle to join with us in opposing further federal bailout intervention for three reasons. First, we're crossing the Rubicon with regard to debt. One fact that's been continually glossed over in the bailout debate is that Washington doesn't have money in hand for any of these proposals. Every penny would be borrowed. Estimates for what the government is willing to spend on bailouts and stimulus efforts for this year reach as much as $7.7 trillion according to Bloomberg.com -- a full half of the United States' yearly economic output. With all the zeroes in the numbers, it's no wonder Washington politicians have lost track. That trillion-dollar figure is the tip of the iceberg when it comes to checks written by the federal government that it can't cash. Former U.S. Comptroller General David Walker puts our nation's total debt and unpaid promises, like Social Security, at roughly $52 trillion -- an invisible mortgage of $450,000 on every American household. Borrowing money to "solve" a problem created by too much debt seems odd. And as fiscally conservative Republicans, we take no pleasure in pointing out that many in our own party have been just as complicit in running up the tab as those on the political left. Second, the bailout mentality threatens Americans' sense of personal responsibility. In a free-market system, competition and one's own personal stake motivate people to do their best. In this process, the winners create wealth, jobs and new investment, while others go back to the drawing board better prepared to try again. To an unprecedented degree, government is currently picking winners and losers in the private marketplace, and throwing good money after bad. A prudent investor takes money from low-yield investments and puts them in those that yield better returns. Recent government intervention is doing the opposite -- taking capital generated from productive activities and throwing it at enterprises that in many cases need to reorganize their business model. Take for example the proposed Big Three auto-maker bailout. We think it's very telling that each of the three CEO's flew on their own private jets to Washington to ask for a taxpayer handout. No amount of taxpayer largess could fix a business culture so fundamentally flawed. Third, we'd ask the federal government to stop believing it has all the answers. Our Founding Fathers were clear and deliberate in setting up a system whereby the federal government would only step in for that which states cannot do themselves. An expansionist federal government of the last century has moved us light-years away from that model, but it doesn't mean that Congress can't learn from states that are coming up with solutions that work. In Texas and South Carolina, we've focused on improving "soil conditions" for businesses by cutting taxes, reforming our legal system and our workers' compensation system. We'd humbly suggest that Congress take a page from those playbooks by focusing on targeted tax relief paid for by cutting spending, not by borrowing. In the rush to do "something" to help, federal leaders would be wise to take a line from the Hippocratic Oath, and pledge to do no (more) harm to our country's finances. We can weather this storm if we commit to fiscal prudence and hold true to the values of individual freedom and responsibility that made our nation great. 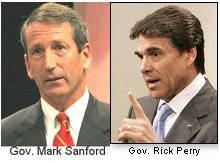 Tags: bailouts, Governor, Mark Sanford, Rick Perry, South Carolina, State, Texas To share or post to your site, click on "Post Link". Please mention / link to the ARRA News Service. Thanks!